What a wonderful art set! Paint This with Jerry Yarnell Fine Art Painting &Drawing Kit for Kids is an amazingly complete art kit, ready to use right from the box. Geared for ages nine and up, Jerry Yarnell has set your child up for successful art education and creation by not leaving anything out. You begin with the obvious choice, Volume 1: How to Begin! Here, Jerry Yarnell explains each and every items included in the set, and how it is used. This is a brilliant video for those who really have had no quality art instruction or experience, lack familiarity with art products and their specific uses, or for those who need a refresher. I had no idea how to use some of the materials included. (Kneaded erasers are strange and wonderful, and I did not have any idea how valuable they could be in a sketch until I saw this video!) Once he explains how all the products are used, he then sets up the paint palette with all eight colors, and readies his canvas for use. The only thing you add is paper towels! He then shows the viewer how to mix and blend the colors on the palette, and how to properly clean your quality brushes. It is one thing to use cheaply made brushes, it is another thing entirely to use these nice ones. You will want to keep them in good condition after use. This is a 34 minute DVD and is essential to understanding how to use this kit well. Once you and your child understand how to use the art supplies correctly, have the palette set up and ready to go, you are ready for the first lesson. You will find this on Volume 2: My First Landscape. Total running time for the DVD is 37 minutes. Interestingly enough, and a little surprising to me, is that this DVD does not begin with the landscape project! It begins with an entirely different 12 minute sketching lesson on how to draw an apple! Your child will learn the importance of where the light is shining as you sketch, how to shade the apple, and the apple’s shadow (the cast), how to use that kneading eraser in a sketch, and how to finish the sketch. This is a perfect beginner art lesson. Then, he moves on to the main event – painting a landscape. As the teacher, this was one of the most delightful lessons I have ever seen. It was systematic, with step by step instructions to the student. I tried this lesson with a group of six children of both sexes to see what would happen. I wanted to see how much each one would hear and incorporate into their finished artwork. The age range of the participating children was 9-16. They watched the instructional video and then completed the project from start to finish. I am not sure how Yarnell School nailed the age range so well, but not one of the children had a hard time following the 25 minute lesson. 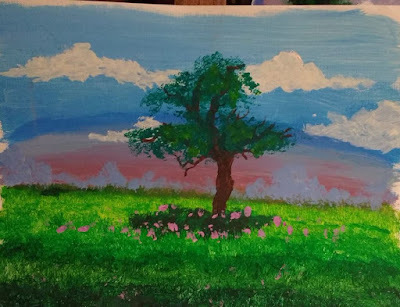 Each of them created a lovely landscape with complex elements like a well-defined tree with leaves and a foreground of flowers, and a detailed background design too. Each of the children displayed their own artistic strategies, and each painting was original to its designer. It was a wonderfully positive experience for all of them. Not included in the kit, but included by the company for review were three other complete lesson DVDs for sale on their site. These include: Volume 3: Apple, Volume 4: Rabbit, and Volume 5: Field of Flowers. Volume 3: Apple begins with setting the background of your canvas. He spends a good deal of time mixing the colors, and applying them in a manner children should really enjoy. Then he utilizes the apple sketch your child drew in DVD 2 as a side by side example to your artist, and lightly sketches the apple onto the painted background. From there, the paint is added, blending and shading as he proceeds through the lesson. Your student will essentially reproduce the apple in paint onto the canvas, learning the techniques needed to create the completed project. I especially enjoyed watching him create the leaf at the top of the apple. There is a movement Yarnell does to create it that, if mastered, should be useful for other artistic endeavors in your child’s painting future. I also liked the end section where he teaches the student how to create the white light reflection that rounds out the apple. There is a heavy focus on blending the apple on the canvas, and creating a life-like finished product. Volume 4: Rabbit is probably my favorite of all the DVDs they sent. Your artist will create a painting from a photograph of a rabbit set up, side by side with the canvas. As I watched this video (as a mom without any real artistic talent), I thought, I could probably do this! Jerry Yarnell’s videos are encouraging because even those of us without any natural talent can actually create something that’s lovely. Again, this is a step by step video that begins with mixing paints, and setting the background. This time, your artist will add leaves and grasses along the way. Once the background is set, he shows you how to sketch the outline of the rabbit. Once that is completed, the student fills in the inside, adding different colors along with shading and outlining details. The camera returns to the palette throughout to show which colors he mixes to create the various colors used for the rabbit. Towards the end he shows you how to create the specific details and outlines to finely detail the finished artwork. This DVD is 35 minutes. It is quite possible to break this longer class into more than one lesson. I can also see this DVD utilized with photos of different animals. The same principles apply, and can really be used over and over. Volume 5: Field of Flowers is exactly what it sounds like! The DVD begins with Jerry Yarnell setting up the canvas and the palette. He sets up, side by side, the photograph of the field of flowers found in a magazine (you can choose whichever one you wish, or use his). He then shows your student different brush techniques for painting the background in various greens. Because the kit comes with several brushes, he really utilizes these in this DVD, and explains their use and shows how to use them in the best way for this project. Then your student will add the flowers with different colors as well as different brushes. I really like the focus on brush techniques in this DVD. It is quite versatile and has many uses beyond the field of flowers. He ends the 34 minute DVD by demonstrating a specific splatter technique done with a toothbrush. This adds a complementary finishing touch that nothing else could replicate. 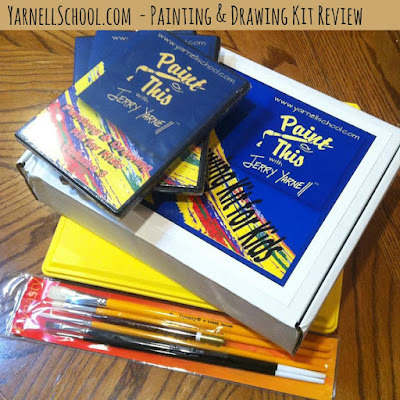 Paint This with Jerry Yarnell Fine Art Painting & Drawing Kit for Kids retails for $149. The included DVDs, 1 and 2, along with the high quality art supplies, are an excellent whole course that can be used repeatedly. There is enough paint to replicate the lessons several times, expand upon them, and add to them. While Jerry Yarnell demonstrates how to sketch an apple, the same principles could certainly be used for other still life items. The same can be said for the painting projects. The separate DVD lessons, sold separately for $25 each, can follow a similar pattern. While watching the rabbit painting project, I could imagine repeating it with each child’s favorite animal photograph. Your student is only limited by their imagination. I appreciate the genuine step by step instruction and careful demonstration by Jerry Yarnell. He leaves nothing out so that even the most timid homeschooling parent will feel comfortable using this resource with their children. This is highly recommended! This review was written for The Old Schoolhouse Magazine, LLC and is found on their site at this link.